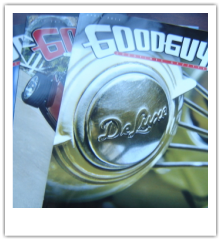 The Goodguys Rod & Custom Association promotes and produces some of the world’s most exciting automotive events. Founded by lifelong hot rodder Gary Meadors in 1983, Goodguys events feature thousands of hot rods and custom car shows in locations such as fairgrounds, super speedways and outdoor stadiums. The cars, the vendor exhibits, the live entertainment, and people create a great atmosphere to be enjoyed by everyone. Goodguys offers over 20 events annually across the country from the West Coast to the East Coast and all points in between. The events range from two-day shows attended by 30,000 to 40,000 people to three and four day shows attracting over 100,000 auto enthusiasts.